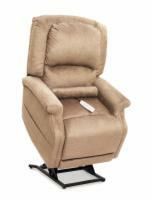 The MaxiComfort PR-505T is based on Golden's best selling Comforter PR-501 lift chair series. While keeping the same design, the MaxiComfort adds an infinite-position recline mechanism for enhanced positioning. Golden's infinite-position recline goes further back than the competitors', even allowing you to rest in a position where your feet are higher than your head to improve circulation. You'll also benefit from the 7-year pro-rated warranty. Best Feature: The PR-505T is the roomiest MaxiComfort chair available, with infinite positioning for ultimate comfort. Our Recommendation: This is our favorite Golden lift chair for the serious lift chair user with a larger body size. 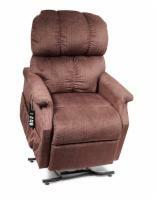 You can watch TV, lay flat, relieve pressure, and improve circulation in the many positions offered by this lift chair.